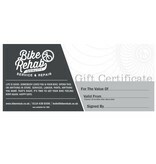 Bike Rehab Gift Voucher, Available in £10, £20, £30, £40, £50. Not sure what to get the bicycle enthusiast in your life? Why not get a gift voucher and let them choose themselves. Vouchers can be spent on anything in store or any workshop service at Bike Rehab. Vouchers have to be redeemed in store. Tools, lubricants, lights, accessories or anything else we sell! If you'd like a custom amount creating, give us a call and we can sort it out.